I recently took a trip back home where I was able to spend a week and a half with family and friends. It was AMAZING, seriously one of my best times I’ve ever had. Since returning home, that’s another story. Getting back into the schedule of every day life has been, well lets just say rough. Trying to fix/catch up on everything at work has made me all but forgot how relaxing my time has been. I have been teetering on the edge of my last nerve. Now, it’s real easy to let everything get to you, making your whole day nothing but one fuming, tongue biting, glaring moment after another. Does that really sound like a good day to you though? Keeping all that bottled up rage inside of you will just make you snap! Although daydreaming about stabbing someone in the eye can be pleasurable (what just me?) it is probably not the healthiest way to deal with your annoyances. 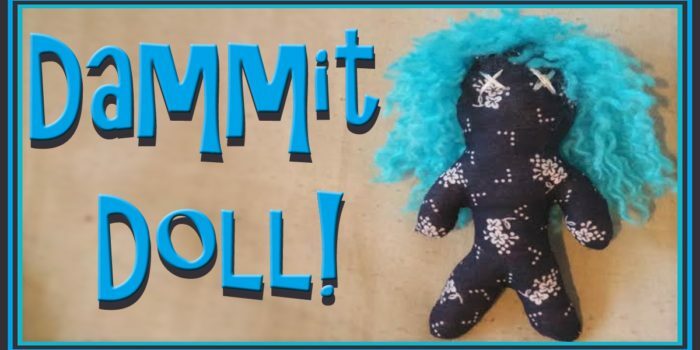 With this little dammit doll, you have the perfect thing to direct your rage. 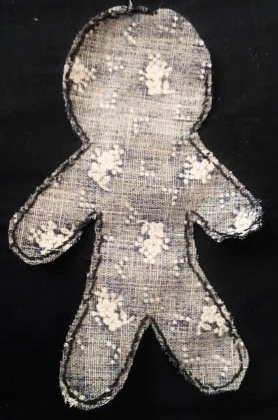 It is super easy to make, takes no more than basic sewing skills (on machine or by hand), and really you cant mess it up! ♦Fabric- perfect way to use up scraps! ♦Yarn- again perfect way to use scraps! Optional button for eyes or you can just make ‘X’ like I did. 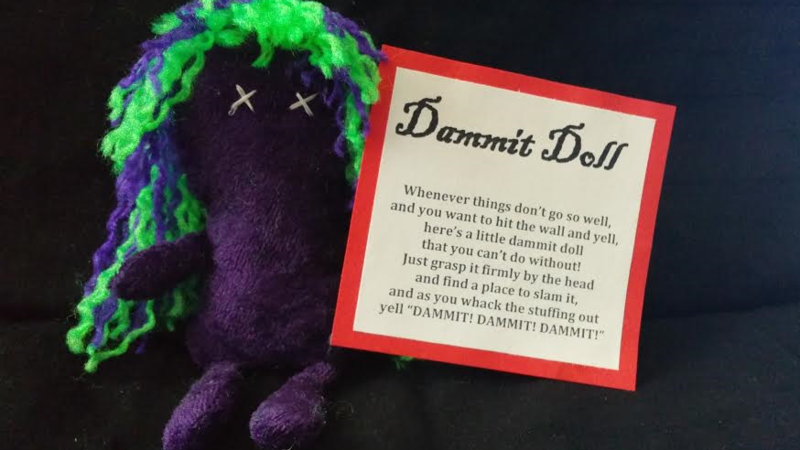 Optional print off of the dammit doll poems. To start you need to draw out your pattern. As I said, you really cant screw this up so don’t stress yourself out about it being perfect. I have made two different kinds. The first kind is the one I recommend if plan on actually using your doll. Since its all one piece its very unlikely that you will accidently rip a leg off. This second kind has all the body parts separate and then you have to sew them together. Although I actually like the look of this one more, its not as practical for usage. So you will have to decide which style you would like to go with. Make it as big or as small as you want! 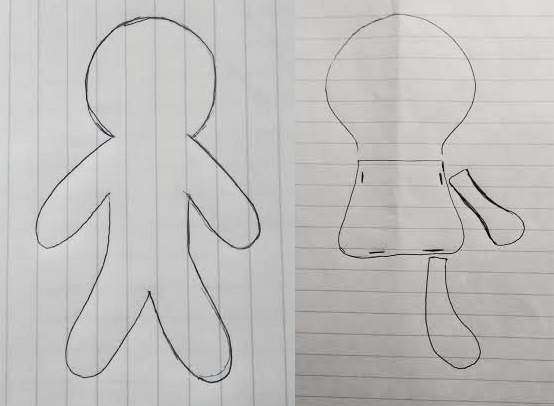 Don’t like either of these shapes? No problem! Have fun with it, go crazy! I’ve even seen one made that was just a circle pillow, really anything works. cut around your pattern, leaving an edge for you to sew on. I admit I tend not to leave as big of an edge as I should, so learn from me and make sure you give yourself space! 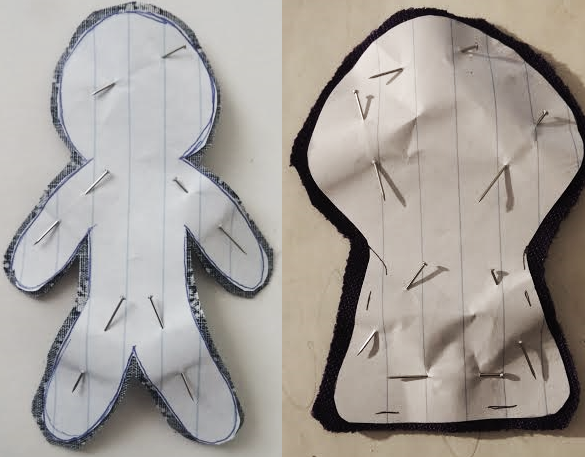 When sewing I start on the side of the head and make my way around the body. Remember to leave yourself enough room to flip your doll right side out! Once its facing out stuff your doll till its nice and firm. Tuck in the edge and sew up the hole, don’t worry if its looking a little awkward. The reason I do this on the head is because I add hair, so that area will get covered up. To make the hair wrap some yarn around your hand, I wrap around the palm of my hand because then I have extra there that I can later cut off what I don’t need. You really don’t need a lot, only do it like 10 or so times. keeping it in the looping shape, loosely, (pretty much just so that it stays) sew the hair on top of the head. I typically just make a line right down the seem where my fabric meets. 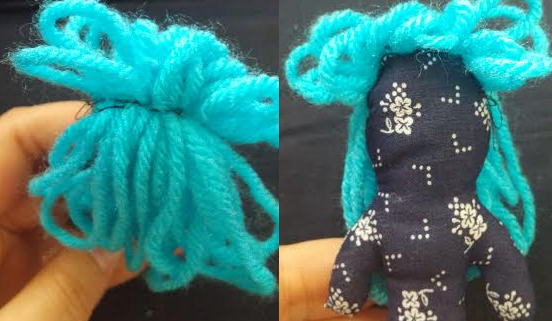 Make sure to put some yarn forward so your doll has bangs! After you are able to let go without it all unraveling you can go back and secure it with more stitches. Once you finish the hair you wont see the thread so don’t get too worried about how its looking. Now that the hair isn’t going anywhere cut the ends of each loop so that you have individual strands. Trim the hair as needed to make it look nice and even. If you look at the yarn you can see that it twists all one way. 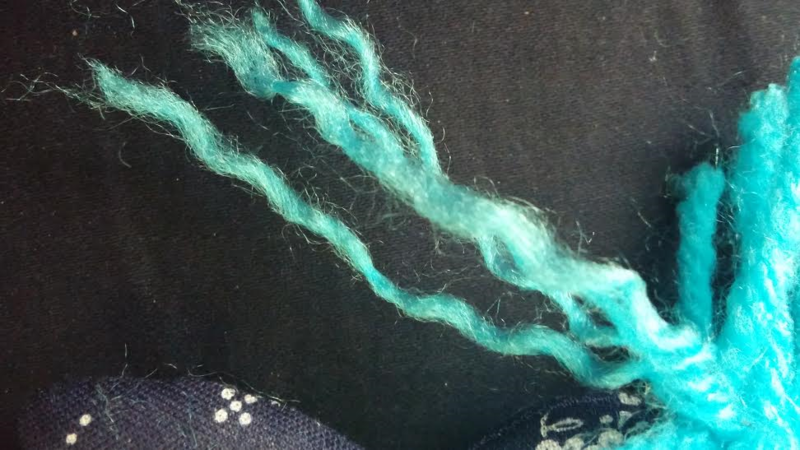 When you twist it the opposite way the little strings pull apart and your able to unravel the yarn. Do this to each piece of yarn! Now that your doll has a beautiful full head of hair your final step is to embroider the eyes. 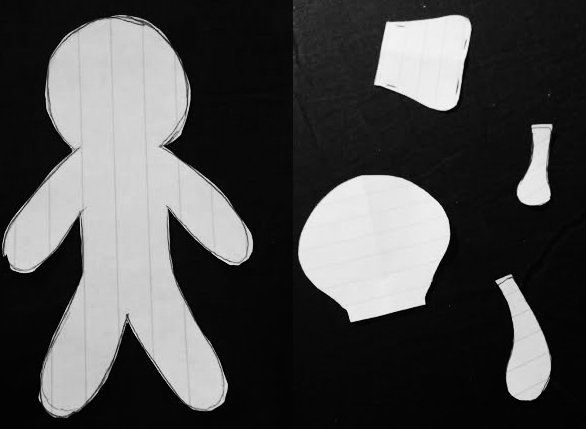 I like to do the traditional x’s, but if you want to do buttons or glue on fabric/plastic eyes that’s all up to you! 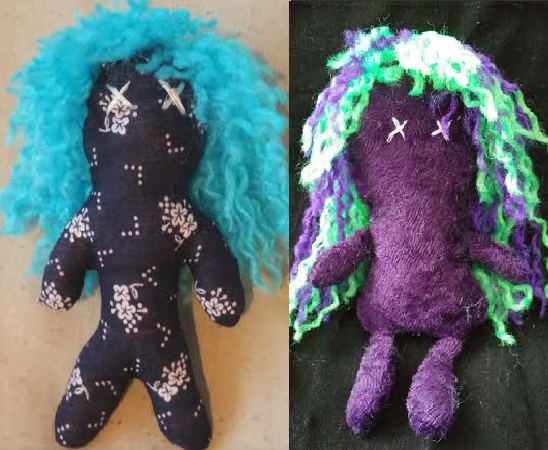 If your looking for a more specific doll (for teachers, parents, sickness, computer problems…) I found this awesome thread on craftsayings.com that has a bunch of different ideas, to check them out just click HERE. If you come up with a fun one make sure you share it!